I’ve always liked this quote. Ellen Lupton is something of a design hero of mine. This phrase of hers nicely captures a key component of design. Too often, amateur or DIY designers think just getting some creative forms into a design is enough. They fail to take into account that a successful design also requires precision in spacing. Badly-handled spacing is one of the dead giveaways that a professional designer wasn’t hired- or at least not a good one. This can be anything from poor kerning in type (have you seen these terrible/funny examples?) to a cramped restaurant menu to packaging that just seems off, even if you can’t put your finger on it. There is no doubt that spacing is just as important to an act of design as the elements you use for it. 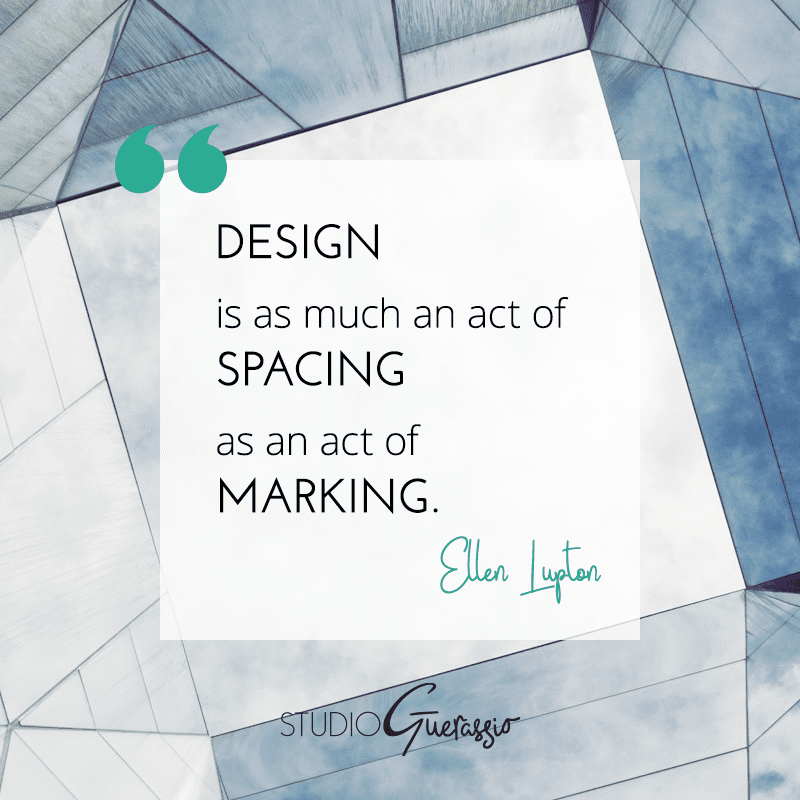 It matters what elements you create and the forms you choose for them. It matters where you place them, in relation to each other and the larger piece as a whole. And it matters what you choose to leave out. Design is also an act of omitting. Editing! Deleting! Yes, this is tied to the other two elements, and part of both of them, but also its own separate skill and mindset. It’s a willingness to cull your own creations, when they don’t work or don’t fit for a piece. It’s realizing when one shape will suffice instead of three. It’s recognizing when the simplicity of black and white is more powerful than a full color palette. It’s a purposeful act of destruction in service to creating something better. Creation and composition will get your design most of the way, but a critical eye will bring it home. What do you think? Do my 3 C’s cover it, or is there another part to the act of design that I missed?